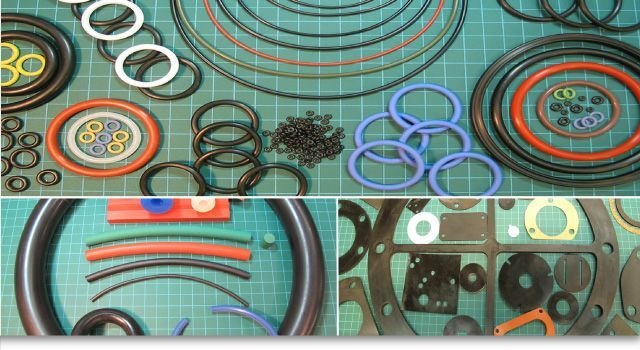 Welcome to Global Rubber Products Ltd. For over 40 years we have supplied industries with rubber O-Rings, Q-Rings, Tetra Seals, Back-up Rings, O-Ring Cord, Cord Rings, Sheet Rubber and Die Cut Gaskets. Learn more about our company. We carry a number of stocked compounds, including: Nitrile, Neoprene®, Silicone, Fluorosilicone, EPDM, Teflon®, and Urethane. From lengths of precision extruded O-Ring material we manufacture custom vulcanized (hot spliced) O-Rings in-house, in your choice of imperial and metric sizes. Custom gaskets can be die cut from various sheet rubber compounds, and we also have C.A.D. capabilities. For information about our products, please download our product list (PDF) or visit our product catalogue page. To order a product or request a quote, please complete our online form. Kalrez®, Neoprene®, and Hypalon® are registered trademarks of DuPont® Performance Elastomers.